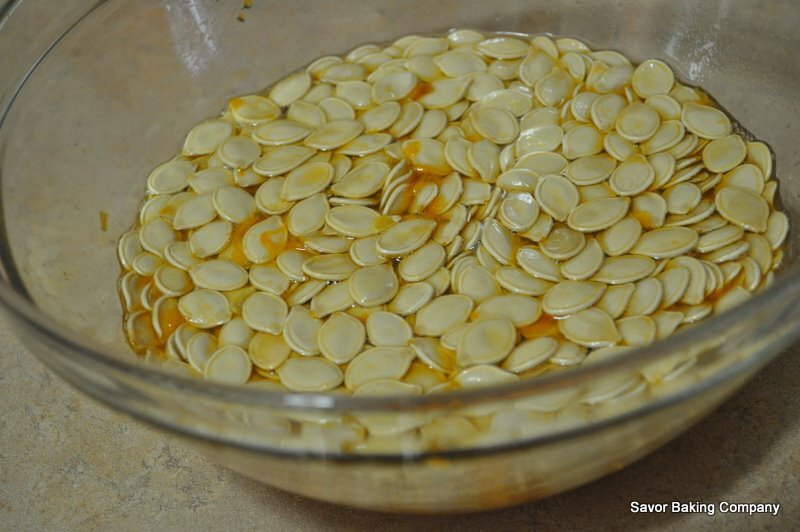 If you are carving that holiday pumpkin in preparation for Halloween or planning on making a pumpkin pie using fresh pumpkin, don’t throw those seeds away! With a little extra effort, you can turn those seeds into a great (and healthy-er) snack. See below for the recipe. Scoop out seeds from a pumpkin using a sturdy spoon. Place seeds in a bowl of cold water to facilitate separation from the pulp and strings. It is okay if you do not remove all of the pulp completely as it adds flavor to the roasting process. Drain seeds and let dry slightly. Toss seeds in butter or oil of your choice along with salt, pepper or whatever spice(s) you desire. (I used salt and garlic powder on the seeds in the final photo). Spread seeds evenly in a single layer on a sheet pan and roast about 10-15 minutes, or until golden brown. Remove sheet pan from oven and allow the seeds to cool completely before eating. Enjoy! This entry was posted in Baking with Savor, Cooking with Savor, Recipes, Savor Tips and tagged baking, cooking, Fall recipes, food basics, Hall, Halloween, healthy snacks, how-to, kitchen, pumpkin, pumpkin recipes, pumpkin seeds, recipes, roasting, scratch, temperature, winter squash. Bookmark the permalink.